Travis Lazarus "Travie" McCoy (born August 5, 1981) is an American singer and rapper. 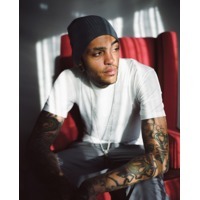 He is the lead vocalist of the alternative hip-hop band Gym Class Heroes. He released his first solo album, Lazarus, on June 8, 2010. Raised in Geneva, New York, McCoy became involved with both hip-hop and punk rock scenes as a teenager. He formed the group Gym Class Heroes with childhood friend Matt McGinley, and after several line-up changes, the group was signed to Fueled By Ramen released their debut album. The group achieved mainstream success in 2006 when its album As Cruel as School Children was released, and continued its success with the 2008 album The Quilt. Gym Class Heroes took a three year hiatus from music, leaving McCoy to focus on his solo career; McCoy released his debut solo album, Lazarus, in 2010. The lead single from the album, "Billionaire" featuring Bruno Mars, peaked at #4 on the Billboard Hot 100 and #3 on the UK Singles Chart. The single was certified double platinum by the RIAA. Currently, McCoy is working on Gym Class Heroes' fourth studio album, The Papercut Chronicles II.